SCOTTSDALE, Ariz. – February 4, 2019 – Barrett-Jackson’s 48th Annual Scottsdale Auction proved once again to be the barometer of the collector car market. 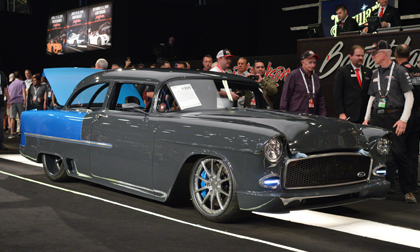 With over 1,800 vehicles offered and a sell-through rate of 99.75 percent, this January marked one of the most successful auctions in Barrett-Jackson history. Not only did total auction sales soar to $131.6 million, but the weeklong event solidified significant market trends, as well as dynamic shifts in the hobby, which have been predicted by Barrett-Jackson Chairman and CEO Craig Jackson and President Steve Davis since the early 2000s. Based on internal sales and market data over the last decade, among the trends Barrett-Jackson identified was the growing demand for professionally built Resto-Mods, as well as an increasing number of Gen X and millennial buyers coming to the hobby. As early as 2000, Jackson and Davis forecast another shift in the market – the growth of professionally built Resto-Mods, largely due to the burgeoning accessibility of new technology, high-quality custom parts and top-notch design talent. In 2002, Barrett-Jackson began consigning more Resto-Mods, which are defined as domestic and import cars that retain their classic look, but have been restored (resto) and modified (mod) with modern-day bodywork, technology, engine, drivetrain and interiors. Unlike a custom vehicle, a Resto-Mod features the latest technology rather than period-correct equipment. Over the last decade, Resto-Mods have seen a meteoric rise in interest among buyers. The immensely popular SEMA Show and the coveted Detroit Autorama Ridler Award are among the factors contributing to the demand. Established in 1971 and headquartered in Scottsdale, Arizona, Barrett-Jackson, The World’s Greatest Collector Car Auctions®, is the leader in collector car and automotive lifestyle events, which include authentic automobilia auctions and the sale of high-profile estates and private collections. The company produces auctions in Scottsdale, Arizona; Palm Beach, Florida; at Mohegan Sun in Connecticut; and Las Vegas, Nevada. With broadcast partners MotorTrend (formerly Velocity) and the Discovery networks, Barrett-Jackson features extensive live television coverage , including broadcasts in over 150 countries internationally. Barrett-Jackson also endorses a one-of-a-kind collector car insurance for collector vehicles and other valued belongings. For more information about Barrett-Jackson, visit Barrett-Jackson.com or call 480-421-6694.